Sourish Bhattacharya has her expertise in microbial synthesis of biopolymers for biomedical applications. The derived ε-PL may be conjugated with other biopolymers for its application as water absorbable hydrogels, drug carriers, and anticancer agent. Further, it will also provide the knowledge pertaining to the synthesis pathway of the microbe for producing such biopolymers which can replace the chemical synthesis process. Sourish Bhattacharya has completed his B. Tech in Biotechnology from West Bengal University of Technology and M.Tech in Fermentation Technology from Institute of Chemical Technology, Mumbai. He worked as Research Executive at Innovative Creations Business Modules Pvt. Ltd., India for 2 years. 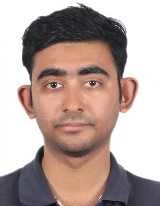 Presently he is working as Junior Scientist at Central Salt and Marine Chemicals Research Institute, Council of Scientific and Industrial Research, India. He has published 11 research works in reputed international journals. He also owns one patent on Marine microalgal biofuel. He is currently working on various areas involving microbial synthesis of ε-polylysine as well as for biomedical applications.